A war fought from 1939 to 1945, in which Great Britain, France, the Soviet Union, the United States, China, and other allies defeated Germany, Italy, and Japan. Nazism or National Socialism (German Nationalsozialismus) refers to the totalitarian ideology of the dictatorship which ruled Germany from 1933 to 1945: the 'Third Reich'. In this ideology, the German nation and the purported "Aryan" race were considered superior to all other races. Nazism is usually associated with Fascism. In the realm of popular culture, the most striking feature was the spread of a worldwide culture, influenced heavily by the Americans. This was made possible by the availability of cheap transistor radios, television, films, and recordings, and by inexpensive travel opportunities. Popular culture was thus the product of a society where such technologies were commonplace, a society based on prosperity and consumption. The new culture glorified youth, and film stars like Marilyn Monroe (1926-62) and James Dean (1931-55) became international symbols. Perhaps the most famous purveyor of this culture was the Beatles, a popular British rock and roll band. The band members clearly represented the new international, youthful culture of carefree, good-humored hedonism. This youth culture flourished easily in Western Europe, but even Soviet youth clamored for blue jeans and Western music. 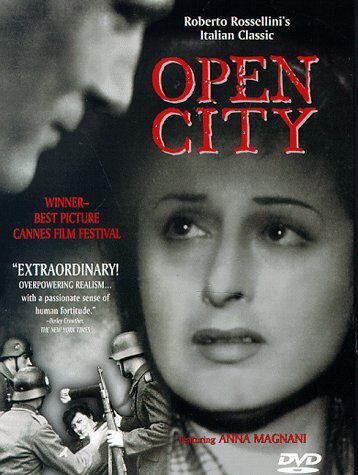 Rossellini's ROMA, CITTA APERTA (Rome, Open City) was the first significant film in the neo-realist style. Thus, aside from its own many qualities, it is one of the most important films in the history ot the cinema in terms of its wide influence on other film-makers. In 1944, a wealthy Roman lady commissioned Rossellini to make a brief documentary about a priest who had been killed by the Germans. She then suggested a second short on the Resistance activities of Roman children. The director decided to combine both themes into a single, feature-Iength fiction film based on the real events and the experiences that the Romans lived through between 1943 and 1944; the action of the film, however, was to be confined to a three-day period. Rossellini and the writer Alberto Consiglio (who had collaborated with him on L'Uomo della Croce, 1943, The Man of the Cross) wrote the first draft of the script; this was then substantially added to by the writer Sergio Amidei, with further additions by the then cartoonist (and future director) Federico Fellini. Money was a constant problem as Rossellini's sponsors ran out of funds. He managed to raise small amounts which enabled him to continue shooting for a time, but eventually he was reduced to selling his furniture and his clothes. Film stock was very hard to come by - even when he had money to pay for it - so Rossellini was forced to use pieces of 35mm newsreel stock of varying lengths and quality. Due to a lack of equipment, and for economic reasons, the film was shot mute with the actors dubbing their dialogue later. Most of the footage remained undeveloped until shooting was completed because Rossellini could not afford laboratory costs. Nonetheless, such technical limitations worked to the final advantage of the film. ROME, OPEN CITY has the 'real' appearance of a newsreel, which led to the oft-repeated tale (unfounded in fact) that the film was shot with concealed cameras before the Germans had left Rome. Except for three small studio reconstructions, the entire picture was filmed where the events on which it was based took place; the city thus played a major part in the action. While the cast was a mixture of experienced actors (such as Anna Magnani and Aldo Fabrizi) and non-professionals, there is a raw, natural quality to the performances which belies acting. This is aided by the equally 'raw' images produced by the cinematographer Ubaldo Arata, who worked with available lighting. The fragmented construction of the narrative, with many scenes seemingly unfinished, nourishes an excitement that might well have been dissipated by a more polished script. ROME, OPEN CITY is a direct portraIt of the time in which it was made; life as it was then lived is reflected on the screen with great authenticity. As important as the historical moment in the film are the characters, who seem to have lives that extend beyond the brief periods that the film captures. It is this quality above all which continues to give the film its power to move modern audiences. According to Rossellini, when the film was eventually completed, everyone he showed it to hated it. 'For want of anything better' the Italians entered it at the Cannes Film Festival, where the director claims it was ignored by everyone. However, it was bought for international distribution 'for a crust of bread', and opened in Paris to rave reviews and booming business. This success was soon surpassed in the USA. 'I suddenly went from artistic cretin to international genius in a matter of weeks', Rossellini commented wryly some years later. The film then did well in Italy on the basis of its foreign reputation, but the pattern had been set, both for neo-reallsm and Rossellini. With each new film be would be denounced as a 'cretin' in his own country; neo-realist films would remain most popular outside Italy, finding special favour in France and Britain. The elements that made ROME, OPEN CITY into a bombshell which blasted apart the cinematic conventions of 1945 were those that were to make up the theory, and often the often the practice, of the many neo-realist films that followed it.